As you know I just published my fourth origami book: Floral Origami (buy the book at amazon) recently. I have so much to say, that I can’t limit myself with short social media posts 🙂 Here I am with my wall of text. What is in this origami book? I included the whole range of floral models: origami flowers, origami leaves, kusudamas. I start with several really easy flowers and then proceed with more complicated ones, adding complexity gradually. Those easy origami flowers also serve the purpose of an ideal starter for the people who are new to origami. 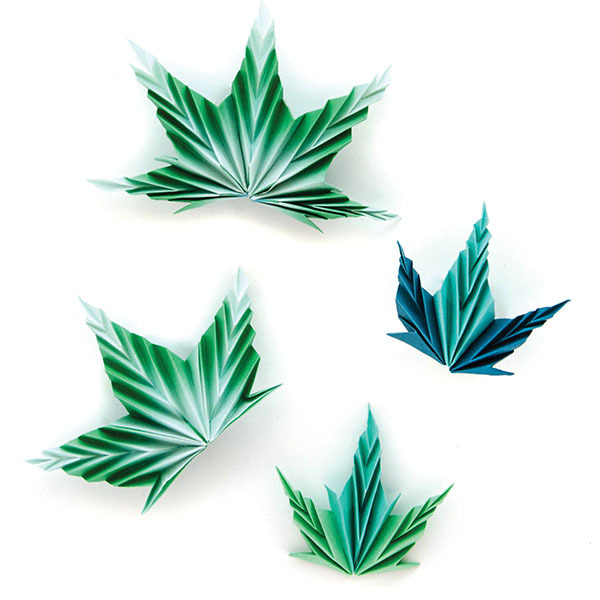 You can use the separate origami flowers and leaves for various origami decoration projects: greeting cards, bouquets. I designed several leaf types specially for this book. I also tried to focus on origami models from square. Rectangles can be great in folding, but let’s be honest, no one likes to cut them! And I am proud to say that only one, ONE model in the book uses rectangle papers. That one is just awesome, so I included it. All other models are from square! All that makes Floral Origami your best origami travel book. I also created several models specially for this book (read the story below). I tried to include as many different flower shapes as possible. I revamped Mattiola model a bit and created Almond, because I am fascinated by double petal models. Almond origami kusudama, that I specially designed for this book. 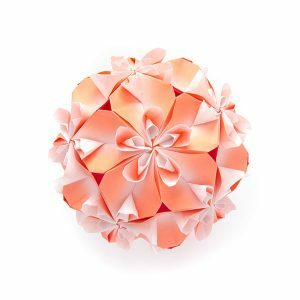 Mattiola kusudama. I had this model designed long ago, but it did not have those pretty petals in the center! With just one squash fold added on each side I could improve the old model. Mattiola already existed in my portfolio, but for some reason I never tried to squash the central connecting petal in halves, which results in those tiny little petals inside the flower! If you want to see the whole list of models with their technical specifications, please follow this link. This book has a long story behind it. Many strange coincidences played their role in its creation… Or may they be not coincidences? Strange coincidence one and two: is doing everything in advance right or wrong? The plan for this book goes back to about December 2016, yes, long, long ago! 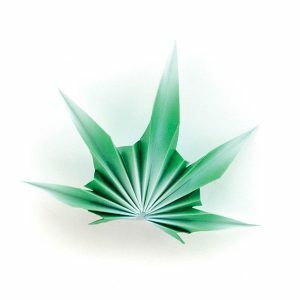 Some publisher contacted me about the botanical origami book. Publishers are the people who usually ask you to do something ASAP and then you wait a month for their reply (after you did something ASAP). Knowing that I decided to start doing something until it’s not too late. Which included finding appropriate origami flower models, improving existing models or even creating new ones. Flowers are not my favorite topic, I usually like creating something more stylish or geometric. So it was a good way to channel inspiration towards little different direction. I should also mention that at that time I was completely free and unemployed person, so things went really fast. Since you wait weeks for every reply you have time to draw some diagrams. In two months it became obvious that negotiation is not going to happen for a bunch of reasons. And I was left with a lot of ready good diagrams. 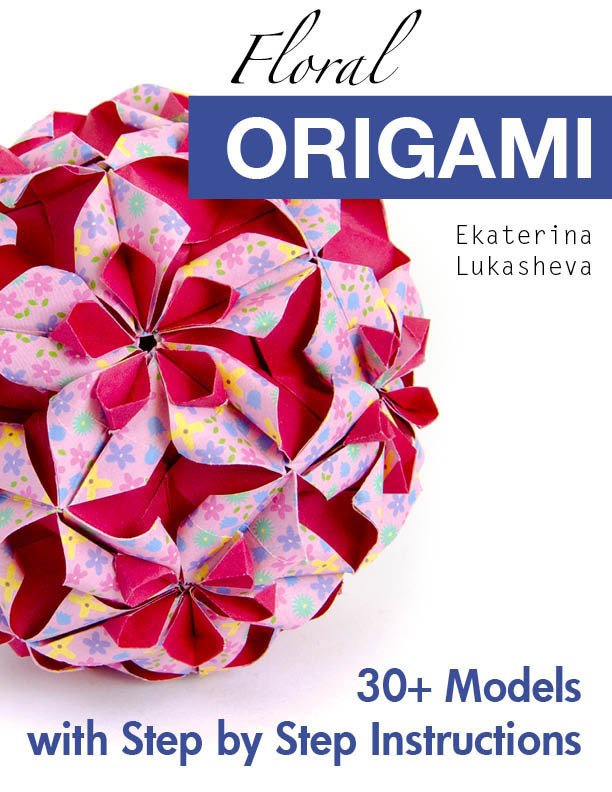 There are many ways you actually can publish origami book on your own. One of them is CreateSpace, which many people use. Another method was demonstrated recently by Alessandro Beber, publishing his very niche book about tessellations. If you have some non-mainstream origami, that might be a good thing to think about. Deciding between those different paths is painful. Deciding is always very painful for me personally. Don’t ask me to decide something about my models, please! I could not decide anything and kept postponing the whole thing. Then I started my job hunt and had to forget about origami completely. After all I can’t handle two highly stressful things at a time. I was too busy for too long, and I still haven’t decided anything. Strange coincidence 3, that I created myself : If you want to recharge meet with great people! I was too tired and uninspired until December 2017. Maybe I needed rest or reboot, or it’s CDO and people there charged me with positive origami energy? Or maybe people asking me about tessellation book… wait, I have a book to publish, not tessellation origami book, but still a ton of good material! Anyway suddenly I felt like completing it. I asked facebook friends and… they gave me a final magic kick to return to the idea of making an origami book. But there was still some (complicated) questions to solve. And here comes my time (its absence to be precise). Full time job is not a joke after all. If you subtract time from the equation of choice, there are not much options left! Voila! So I decided to come the fastest way I already know. 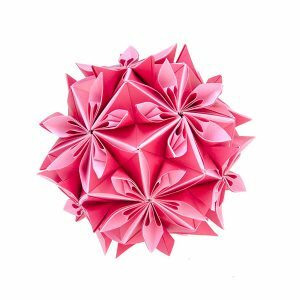 I published my last 2 books (Modular Origami Kaleidoscope and Modern Kusudama Origami) using this method. This also triggered limitations in book space and cancelled some models that were already in process of diagramming. And some other things I was procrastinating. This also reduced time needed. And after all I just felt that it’s not fair towards my models and diagrams to keep them away from people. I want them to be folded, enjoyed, adored! Happy folding everybody! I really hope you enjoy it! Very excited to look at the new books.